I have begun to create my Personal Learning Space… for which I prefer a flexible web site in an area that can outlive specific technologies and institutional changes. If I invest time in creating things like this I want to feel they can be preserved for use in future. Using proprietary products frustrates me as I know they will be lost or become unavailable sooner rather than later usually. The space uses a new (to me) flexible width flowing layout in CSS that should be useful in future projects. I have been meaning to try such a layout for a while, and this was the perfect excuse. It should work on most browsers and mobile platforms. Tests to date are positive in that respect. The site uses my usually folder structure to keep things neat, with all style elements in one directory (inc), images in another (img), further resources (res), and a password protected area for items that cannot be made public, but which I want to gather into the space for convenience. The site also uses, as is normal for my projects, relative URLs throughout so it can be rehosted easily, parts reused in other projects, or the whole site cut to a DVD/CD for archive. 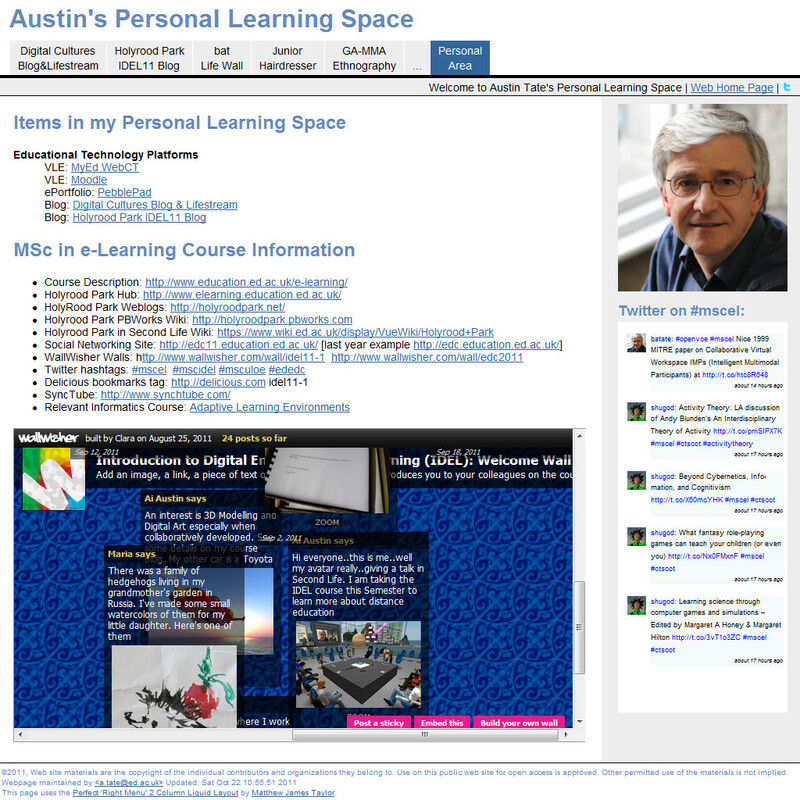 For now the Personal Learning Space just gives quick access tabs to work already done on the MSc in e-Learning, a few blocks of embedded Twitter and the WallWisher for the IDEL11 course, and some useful links for the courses I am on which I previously had scattered across http://openvce.net/mscel and in desktop shortcuts across a number of desktops, a laptop and several mobile devices. The initial space is at http://atate.org/space/.